In this retelling of one of the famous American Folk Legends readers will learn how Davy Crockett saved those who lived and traveled along the Mississippi River from a great alligator, named Snag, which was the size of two river boat steamers. The book doesn’t just have illustrations that depict the legend; the illustrations also make the pages look like pages from an open book. This helps reinforce the concept that this legend is quite the “story” that was told once upon a time. Snag looks mighty fierce—the illustration when he comes up through the “ship’s bow” is quite the picture that could scare little ones who are afraid of giant gators. However, those that love the outlandish legends (and perhaps river monsters who can be conquered by legendary heroes) will enjoy how a seemingly skinny guy in a coonskin cap can save the day. 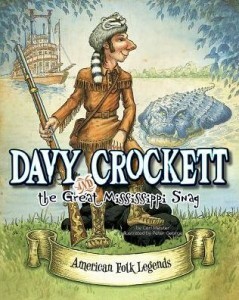 This is a perfect edition to any school or public library where kids need to learn about American legends and folktales. April 8, 2015 in book review, elementary school, juvenile, picture books, preschool.